Clean: Don’t use “filler” words; rather, use clear, precise language. Concise: Get to the point, and know how much detail to use. Prepared: Make sure your message is backed by data. Use language of certainty. Strong nonverbals: Adopt a confident stance, make eye contact, and “take up space” through physical presence and movement. Vocal strength: Speak at a slower pace, don’t use “up-talk” (when your statements sound like questions), and use language of certainty and intention. Appearance: The visual message matters (be professional!). Connect: Build your own board of directors and a mentor network. Stretch: Get out of your comfort zone. Be flexible: Adjust to your audience and grow from mistakes. We were, as we always are, moved by stories of women like these. As a final note, we’d like to share more inspiration and wisdom with you by way of our free white paper, Circles of Light: Women’s Wisdom, in which the female leaders we interviewed give more rich advice on the 3 Cs, and more. To receive the free paper, contact us at coordinator@powerspeaking.com. 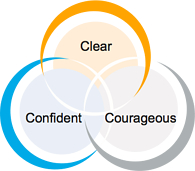 To find out about our Confident Speaking for Women workshop, click here. On the journey with you . . .